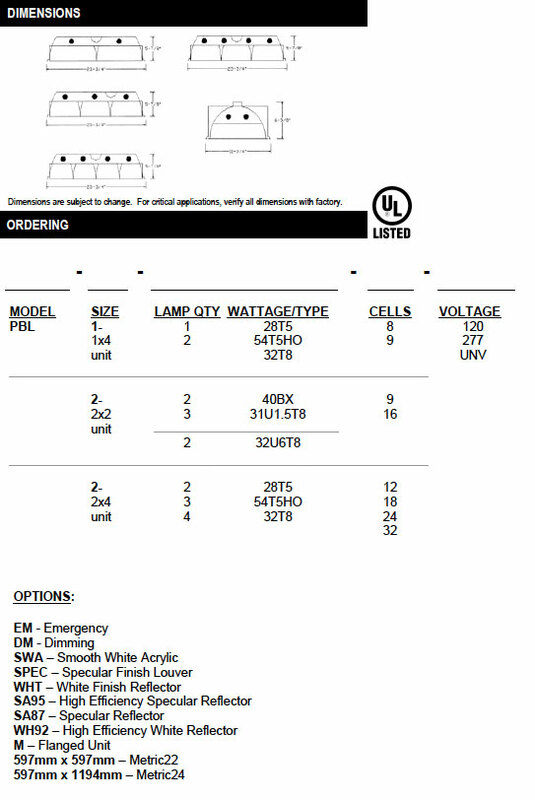 The PBL Deep Cell Parabolic is available in 1×4, 2×2, and 2×4 lengths, 1, 2, 3, and 4 lamp configurations, T8, T5, and BIAX. 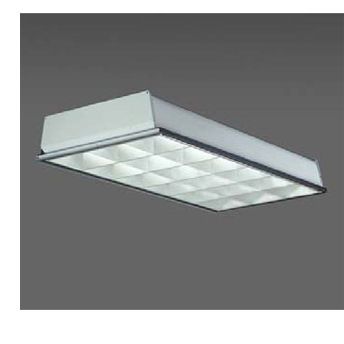 Nominal 3” deep cell parabolic louver provides optimum performance and efficiency, while ensuring a high level of visual comfort. Semispecular natural anodized aluminum louver is virtually maintenance-free. Black reveal louvers hinge from either side and are secured in either the open or the closed position by die formed steel hinges. Mechanical light trap prevents light leaks. All air return functions are optional. Proper lamp positions allow fixture to operate at maximum efficiency with controlled widespread distribution. Available with specular aluminum reflector (87% reflectance), high efficiency white reflector (92% reflectance), or high efficiency specular aluminum reflector (95% reflectance). Metric dimensional housing available. Die-formed heavy gauge rust inhibited cold-rolled steel. Anodized aluminum louver, precision mitered. Standard finish is semi-specular. Optional specular silver and white finishes are available. All parts are pre-painted high-gloss, baked white enamel with minimum 89% reflectance applied over iron phosphate pretreatment, for maximum adhesion and rust resistance.